In this experiment, the researchers turned off a gene called BMAL-1, which is partially responsible for the circadian rhythm. 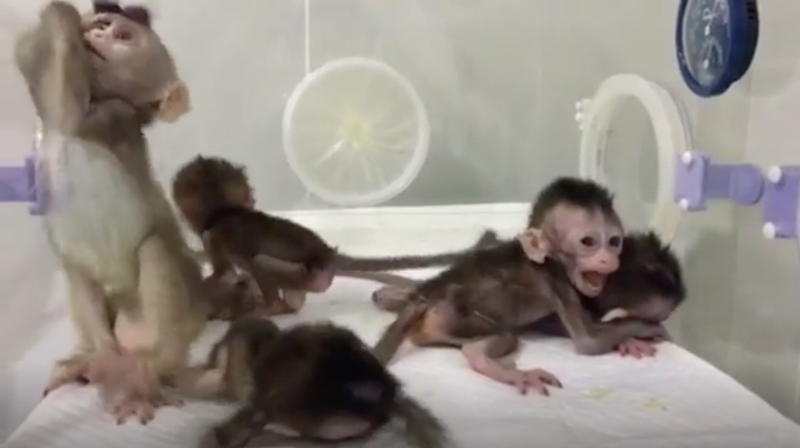 Monkeys with this gene turned off demonstrate increased anxiety and depression, reduced sleep time, and even “schizophrenia-like behaviors,” according to a Science China Press release. Circadian rhythm disruption has even been linked to diabetes and cancer. But why? Researchers hoped to generate custom model organisms closer to humans in order to understand and find potential cures for genetic diseases, including brain diseases, cancer, and other disorders, Hung-Chun Chang, senior author and investigator from the Chinese Academy of Sciences Institute of Neuroscience said in a statement. By creating identical animals, perhaps they could localize causes and cures more quickly. “It’s very clear that these monkeys are seen as tools,” she explained. The team of scientists behind the new announcement tout the monkeys’ suffering—anxiety, depression, and “schizophrenia-like behaviors”—as a success. She noted that the researchers didn’t have scientific hypothesis or treatment they were attempting to prove or disprove, and instead were basically just trying to see what would happen if they edited a crucial gene. It’s kind of like deleting a cryptically named file from your computer’s system folder just to see what will happen. Additionally, these monkeys might appear to be showing behaviors that look like analogues for human diseases, but the comparison between monkeys and humans ends at some point. It’s possible that turning off the BMAL-1 gene would have different effects in humans. And finally, the monkeys’ identical DNA might instead be a weakness. Humans display plenty of genetic differences, so a cure that works for identical macaques might not work when presented to the far messier human genomes. This article has been updated with a quote from Jose Cibelli.